Ishwar Sharma becomes the youngest and the first Indian to win the Gold Medal in the UK National Yoga Championship. The six year old from Sevenoaks, Kent, has made the Indian Community proud in the field of Yoga. 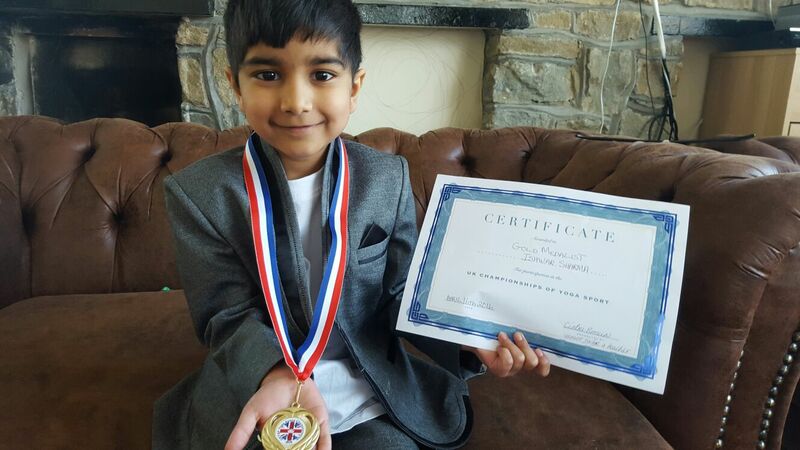 He is the youngest and the first Indian to win the Gold medal in the UK National Yoga Championship (under 11 yrs) held on 16th April 2016 in London. Ishwar Sharma is very interested in Sanskrit and Hindu Scriptures and can chant up to 50 shlokas from the Vedas and the Bhagavath Gita. Yoga is being promoted as a sport in the Olympics. He is hoping to qualify in the Olympics and win a medal for the Country. Furthermore his father Dr Vishwanath won the Silver medal in the Men's section in the same championship and is now qualified to participate in the International Championship to be held in Italy in July this year.